Terpenes are the major component of essential oils biosynthesized in various plant species. The essential oils are widely used as natural flavouring agents, food additives, perfumery and pharmaceuticals. The terpenes are of many types based on presence of numbers of isoprene units i.e. mono (C10), sesqui (C15), di (C20), tri (C30) and tetra (C40). The monoterpenes are diverse in nature and useful for plants and human. Monoterpenes constitute the major portion of the essential oils in the flowers and leaves of plants as natural products. Plant uses these compounds for defence and messaging. A total of 665 sequences have been retrieved related to monoterpenes biosynthesis from public domain. The sequences were assembled together resulting into 159 contigs and singletons. The contigs and singletons were used for in silico identification of microsatellites. The SSR repeats were identified as short sequences of di, tri, tetra, penta and hexanucleotides having maximum percentage of hexanucleotides repeats. The analysis revealed a total of 215 SSRs and their frequency of distribution among monoterpenes of related sequences and functional domain markers (FDM) were also analysed. Homologs sequences not having any terepne synthase group were retrieved as an out group for validation of study. 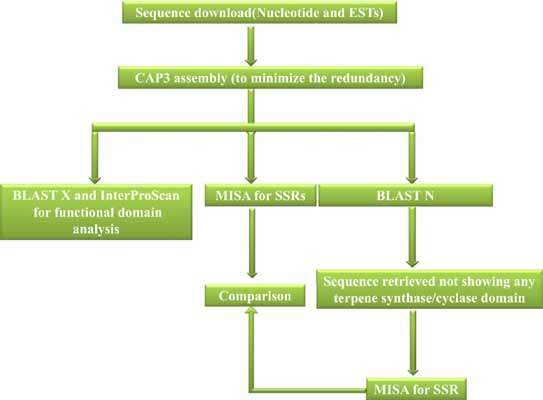 BLAST, CAP3, FASTA, functional domain markers, monoterpenes, SSRs, terpenoid synthases. Biotechnology Division, CSIR-Central Institute of Medicinal and Aromatic Plants, Lucknow, Uttar Pradesh, 226015, India.